Membrane proteins are an important class of proteins, playing a key role in many biological processes, and are a promising target in pharmaceutical development. However, membrane proteins are often difficult to produce in large quantities for the purpose of crystallographic or biochemical analyses. In this paper, we demonstrate that synthetic gene circuits designed specifically to overexpress certain genes can be applied to manipulate the expression kinetics of a model membrane protein, cytochrome bd quinol oxidase in E. coli, resulting in increased expression rates. The synthetic circuit involved is an engineered, autoinducer-independent variant of the lux operon activator LuxR from V. fischeri in an autoregulatory, positive feedback configuration. Our proof-of-concept experiments indicate a statistically significant increase in the rate of production of the bd oxidase membrane protein. Synthetic gene networks provide a feasible solution for the problem of membrane protein production. One of the goals of the emerging discipline of synthetic biology is to make it easy to 'reprogram' the behavior of living organisms by transforming them with novel, rationally engineered, synthetic gene networks. Engineered gene networks have numerous applications in diverse biotechnological endeavors such as metabolic engineering [1, 2], single cell biosensors [3, 4] as well as cell-based computers [5, 6]. Precise regulation of gene expression either through exogenous control or through endogenous autoregulation is often critical for the development of synthetic biology applications. Several strategies have been developed for gene regulation including the development of libraries with modified promoter sequences , development of gene expression toggle switches controlled by exogenous inputs , gene expression pulse generators  and oscillators , and even post-transcriptional regulatory systems . There are numerous reviews detailing the engineering principles behind the development of synthetic gene circuits, recent advances, and potential applications in the future [12–15]. Autoregulation by way of positive or negative feedback is commonly used as a motif in gene regulatory circuits. Depending on the specific circuit topology, feedback often leads to improved performance of the gene regulatory circuits. Specifically, a positive feedback within the regulatory circuit can lead to increased steady state level (amplification) of the gene expression, faster response kinetics, and increased sensitivity to exogenous inducers or autoinducers [16–19]. These properties are particularly suitable for applications such as protein production, where the benefits of increased production rates can directly translate into reduced resource costs and increased profits. While gene circuits are routinely used to express soluble proteins such as green fluorescent protein (GFP) in model circuits, they have not been applied for the production of membrane proteins. The structure and biochemistry of membrane proteins are extremely important to study. About 20% of all genomes sequenced so far appear to encode membrane proteins . Additionally, their key role in the etiology of many diseases make them targets for therapeutic intervention. 60-70% of all drug targets are membrane proteins, such as the G-protein coupled receptor family [21, 22]. Membrane proteins are very difficult to produce . They are normally expressed at very low levels in nature. It is possible to express them at higher levels using strong promoters such as the hybrid tac and trc promoters, or high-activity polymerases such as the T7 RNA polymerase, however there are some inherent drawbacks with these methods such as leaky expression or promoter toxicity. Additionally, heterologous expression of membrane proteins can cause aggregation of the product within the cells. These inclusion bodies have to be separated and refolded in order to reconstitute their native structure. This is often an inefficient and laborious process. We note that there are recent developments in the field of membrane protein expression, such as the development of tunable T7 RNA polymerase-based systems (the so called "Walker strains", C41(DE3) and C43(DE3)) that are not significantly affected by T7 RNAP toxicity . Positive feedback-based synthetic gene circuits offer an alternative to the gene expression techniques discussed above. In this study, we explored the possibility of increasing the expression of the model membrane protein, cytochrome bd quinol oxidase (also referred to as bd oxidase), a terminal oxidase from E. coli. Normally, bd oxidase is expressed under microaerobic conditions since it has a high affinity to oxygen and serves as an oxygen scavenger in low oxygen conditions [24, 25]. Further, the biochemistry of bd oxidase is well-characterized, and methods to measure the gene product levels spectrophotometrically are well established . These features make bd oxidase a good test case to explore the positive feedback-based gene expression system. A positive feedback circuit was built using elements from the quorum sensing system in Vibrio fischeri and the bd oxidase gene as shown in Figure 1. LuxR is a transcriptional activator from the V. fischeri quorum sensing system that binds to its cognate promoter p lux and activates expression of genes under its control. The wild type LuxR is inactive when produced. Acyl homoserine lactone (AHL), produced by another gene, luxI, is an autoinducer that binds LuxR and increases its activity. There are other similar positive feedback circuits based on the wild type LuxR, which rely on the action of AHL, either exogenously supplied, or produced by the action of luxI, for their expression system to operate correctly. A schematic showing the positive feedback-based gene expression system. In our circuit, we specifically desired a regulatory protein that was not reliant on any external co-factors, and operated independent of the cell density in the culture. Fortunately, the structure-activity relationship of LuxR is well-known. Previous studies have determined that an Ala221→Val mutant of LuxR (denoted LuxR*) activates the p lux promoter even in the absence of AHL [19, 27]. The gene network design consisted of two plasmids. The first plasmid encoded a copy of the luxR* gene under a constitutive promoter. The second plasmid encoded a copy of the bd oxidase gene, along with another copy of the luxR* gene in a bi-cistronic configuration. The two-plasmid system was chosen to ensure modularity in design and to enable the facile construction of experimental controls to validate the positive feedback. E. coli strain ML15A is a bd oxidase knockout derivative of the "Walker strain" C43 (DE3) (F - ompT hsdS B ( )gal dcm cyd - ), and was used as the host strain for expressing the wild-type bd oxidase from a plasmid. It has a tendency to overproduce membrane proteins . All cloning work was performed by electroporation using electrocompetent ML15A cells. The C43 (DE3) wild type control does not have any plasmids, and has a chromosomal bd oxidase gene, and was used as a control for observing native expression of bd oxidase. Plasmids pGN3, pKB1 and pKB2 were based on the PRO™Tet6xHN bacterial expression system (Clontech Laboratories, Mountain View, CA). The PRO™Tet6xHN plasmid formed the basis of the plasmids constructed for this experiment, which are described below. The ColE1 origin from PRO™Tet6xHN was replaced by p15A between the restriction sites XbaI and SacI as described by Lutz and Bujard . The chloramphenicol resistance marker was replaced by the ampicillin resistance marker (Ap r ) from pZE21 between the unique restriction enzyme sites XhoI and SacI yielding pPROTetE-Kan-p15A. Schematics showing the different circuits tested. 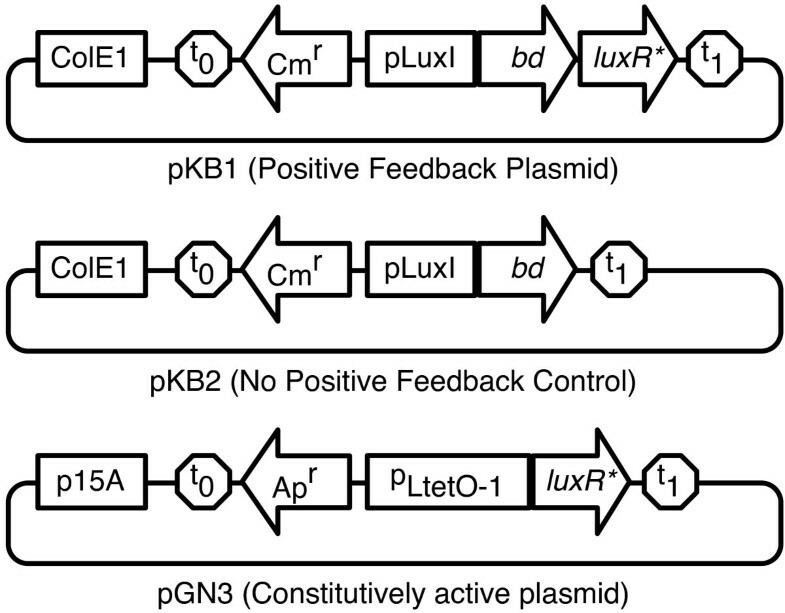 Plasmids pKB1(PF plasmid) and pKB2 (NPF control) are identical except for the absence of the luxR* element responsible for positive feedback on the latter. Plasmid pGN3 is the constitutive plasmid (CP). TetR, and thus the luxR* gene is expressed constitutively in the host. The pGN3 plasmid was used as the constitutive plasmid (CP). pGN29 consists of a plasmid harboring the ColE1 origin of replication, chloramphenicol resistance (Cm r ), a green fluorescent protein (gfp) and a copy of luxR* under the control of the lux promoter (p lux ). The gfp gene was replaced by the bd oxidase gene producing the plasmid pKB1. The bd oxidase gene was extracted from the pTY1 plasmid by PCR using the forward primer 5'(ATA GAA TTC GCG ATG AGC AAG GAG TCA TG ATG TTA GAT ATA GTC G)3' and the reverse primer 5'(ATT AAG CTT CGC TTA GTA CAG AGA GTG GGT GTT ACG TTC AAT ATC)3'. The forward primer contained an EcoRI site (shown in boldface) and the reverse primer contained HindIII site. pGN29 and the PCR product were digested by using EcoRI and HindIII. The PCR product obtained was ligated with the digested pGN29 to obtain the positive feedback plasmid pKB1. The resulting 5.5 kb plasmid was separated using gel electrophoresis. Plasmid pGN23 consists of a ColE1 origin of replication, chloramphenicol resistance and gfp similar to pGN29. However it contains a pLtetO-1promoter, which was replaced by the p lux promoter. In addition, it does not contain the luxR* gene. 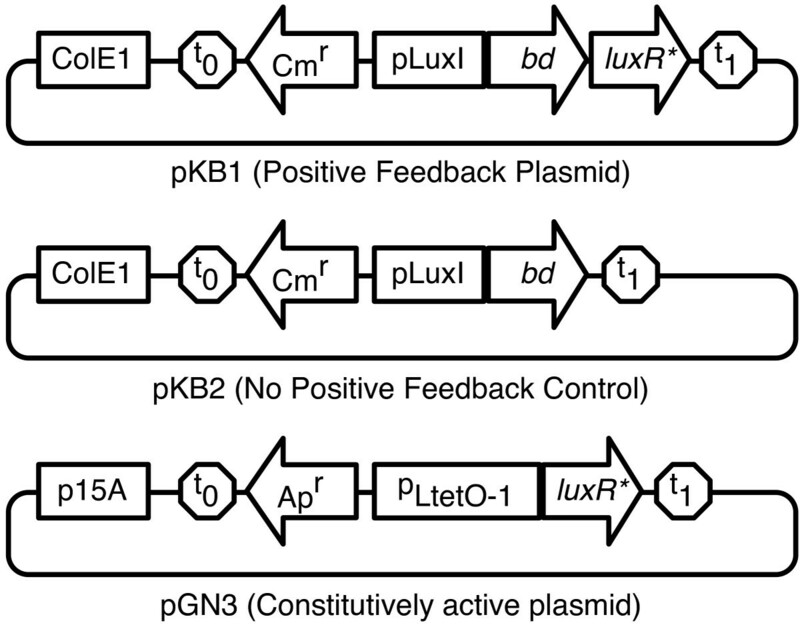 The bd oxidase region was extracted from pTY1 using the same procedure as above, and was similarly ligated with the pGN23 plasmid to obtain the no positive feedback control plasmid pKB2. The resulting plasmid was 4.7 kb. All plasmids were verified using DNA sequencing. The plasmid maps for pKB1, pKB2 and pGN3 are shown in Figure 2. Table 1 shows a list of treatments and various controls along with their designations. Experimental design to test the effect of the positive feedback. For all experiments, cells were grown in 5 ml of LB medium (BD Bacto™Tryptone, BD Bacto™Yeast extract, BD Bacto™agar, sodium chloride) with appropriate antibiotics (Sigma Aldrich, St. Louis, MO). Depending on the plasmid's antibiotic resistance, a combination of 100 μ g/ml ampicillin and 34 μ g/ml chloramphenicol was used. The host strain with the appropriate plasmids was grown initially in 5 ml culture tubes at 30°C in Gyrotory®water bath shaker (Model G76, New Brunswick Scientific, Edison, NJ) overnight in LB medium with the appropriate antibiotics. 2 ml of the overnight culture was transferred to 200 ml of fresh LB medium in 500 ml shake flasks with the appropriate antibiotics and grown at 30°C for 10-12 hours, until the culture reached an optical density of about 0.5. 15 ml of the inoculum prepared as above was transferred to each of the twenty four 2 l flasks containing 1 l LB medium with the appropriate antibiotics. These flasks were shaken at 220 rpm at 30°C using an Innova 4330 incubator shaker (New Brunswick Scientific, Edison, NJ). Samples were taken at 4, 8, 10, 12, 16 and 20 h. At each sampling time four 2 l flasks were removed from the shaker and the cells were peletted at 11,220 × g for 20 min. The pellet was stored at -80°C until further use. The cell pellets were removed from -80°C and suspended in 100 ml of cell lysis buffer (100 mM Tris, 15 mM ethylenediaminetetraacetic acid (EDTA), 15 mM Benzamidine, pH 8.3). Deoxyribonuclease I (Sigma Aldrich, St. Louis, MO) and protease inhibitor cocktail (P8465, Sigma Aldrich, St. Louis, MO) were also added to the above suspension. After the sample was completely suspended in the buffer, cells were broken down by passing the sample 6 times through a nitrogen decompression based cell disruptor. The sample collected after disruption was then centrifuged at 11,220 × g for 20 min and the pellet was discarded. The supernatant was spun down in an ultracentrifuge (L7-65, Beckman Coulter, Fullerton, CA) at 125,000 × g for 4 h. The pellets were collected and stored at -80°C until further processing. The membranes collected for the different time intervals were then taken out from the -80°C freezer and 0.5 g of each sample was weighed out and solublized in 30 ml of buffer (50 mM monopotassium phosphate, 25 mM potassium chloride, 5 mM ethylenediaminetetraacetic acid (EDTA), 0.75% sucrose monododecanoate w/v, pH 6.5). The suspended sample was spun down in an ultracentrifuge at 125,000 × g for 2 h and the supernatant was collected. The supernatant was used to find the concentration of heme d in each sample by obtaining the absorbance spectrum of the sample. In this way, one can quantify the amount of active bd oxidase in the membrane. The absorption at 607 nm is not affected by bd oxidase and serves to eliminate any artifacts due to baseline shifts in the absorbance spectrum. Concentration in micromoles (μM) of bd oxidase produced by the various gene circuits. Refer Table 1 for a description of the treatment and controls. Kinetics of bd oxidase expression. Expression of bd oxidase was measured every four hours. The expression system including both the constitutive plasmid (CP) and the positive feedback plasmid (PF) showed higher expression levels and faster expression kinetics than the controls. A logistic growth curve has been fitted to the readings. For the wild type (WT), the horizontal line represents the average expression of bd oxidase over the experimental interval, with the dotted lines enclosing the confidence interval for the mean. Here, [bd] is the concentration of bd oxidase in μM, A is the final asymptotic level of the growth curve, d is the time required for half-maximal expression, s is a scaling parameter and t is time in hours. This model captures all the parameters of interest of the positive feedback, including amplification (A), delay in expression (d), and system response kinetics (s). For the sample size of six data points per curve, the model parameters in Equation 2 were computed using a non-linear fitting function provided by the open source statistical programming language R®http://r-project.org. Table 3 shows the values of these parameters along with the statistics signifying the goodness-of-fit. Figure 4 shows the statistical comparison between the parameter values for the different circuits. Logistic growth model parameters for the experimental data. For the WT, the average value was assumed to be the asymptotic value (A), while the delay and scale parameters were not estimated. A statistical comparison of the logistic growth curve model parameters. 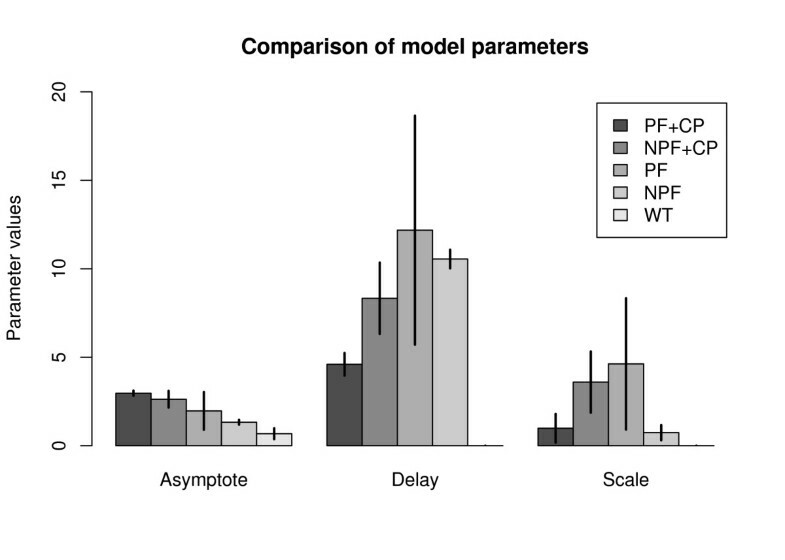 The units for the Y-axis for the Asymptote (A) parameter are micromoles, whereas for delay (d) and scale (s) parameters have the units of hours. The error bars show two standard deviations on either side, representing the confidence intervals for the parameter values. From the data and the computed model parameters (Figures 3 and 4), it is clear that positive feedback has a significant effect on the production kinetics of bd oxidase. This behavior has been previously reported by several researchers in literature for various cytosolic and indicator proteins, and we confirm that it translates to the expression of membrane proteins as well. Qualitatively, our result is slightly different from previous work because in this case, there is a steric limit on the amount of membrane protein that can be produced, governed by the amount of membrane itself. Since the asymptotic membrane protein level is naturally capped, the membrane localization kinetics appear to speed up. Ideally, one would need replicates to determine the variability from sample to sample for each of the data points. While replicates for each time point would have led to greater confidence in the actual values of the model parameters, as a series of six time points they are sufficient to show that there exist significant statistical differences between the treatment and the various controls. Moreover, the non-availability of the time points is a result of the original problem: A large culture volume is needed to produce a sample of membrane protein. In our case, each time point is a pooled sample of four 1 l samples which leads to one measurable reading. Nevertheless, within reason, certain conclusions can be drawn. Firstly, all circuits tested produced more bd oxidase than the wild type. This result was expected since bd oxidase is typically expressed in microaerobic conditions, whereas the conditions in our experiment were aerobic. Secondly, all plasmids used were medium copy plasmids, and by virtue of having multiple copies of the same gene, one can expect a production level higher than that seen in the wild type. Thirdly, the constitutive plasmid (i.e. the constitutive promoter) plays a greater role in the final level of gene expression rather than the positive feedback, since there is no significant difference between the asymptote parameter (A) of the treatment (PF+CP) and the NPF+CP control, while there is a significant difference between the NPF+CP and the NPF controls. Finally, the p lux promoter, which is known to be leaky can cause undesirable expression of the membrane protein, which can lead to high expression levels if there is a positive feedback available to amplify this leaky expression. This is an important consideration when expressing toxic proteins. The positive feedback really shows its benefits in reducing the delay in producing the protein. In other words, the positive feedback can reduce the time required to saturate a membrane with membrane protein, when viewed in comparison with the NPF+CP control. However, the positive feedback might not be sufficient by itself and requires a driver plasmid for maximum productivity. The scaling parameter (s) gives an idea of the rate at which a positive feedback can enable a circuit to switch from the off state to the on state. As the scaling parameter tends to zero, the switching behavior looks more 'digital', i.e. with instantaneous switching between states. In this case, the parameter values are difficult to interpret. 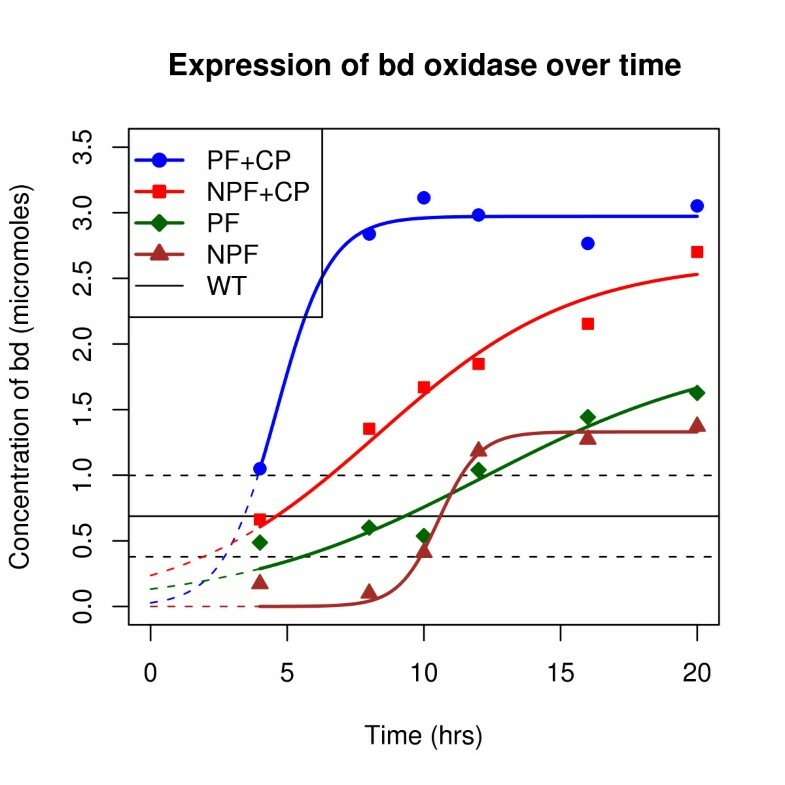 The treatment seems to have a high switching speed (low scaling parameter value), but at the same time the NPF control also seems to have a similar behavior, which could be a computational artifact due to the low final expression level of bd oxidase in this case. 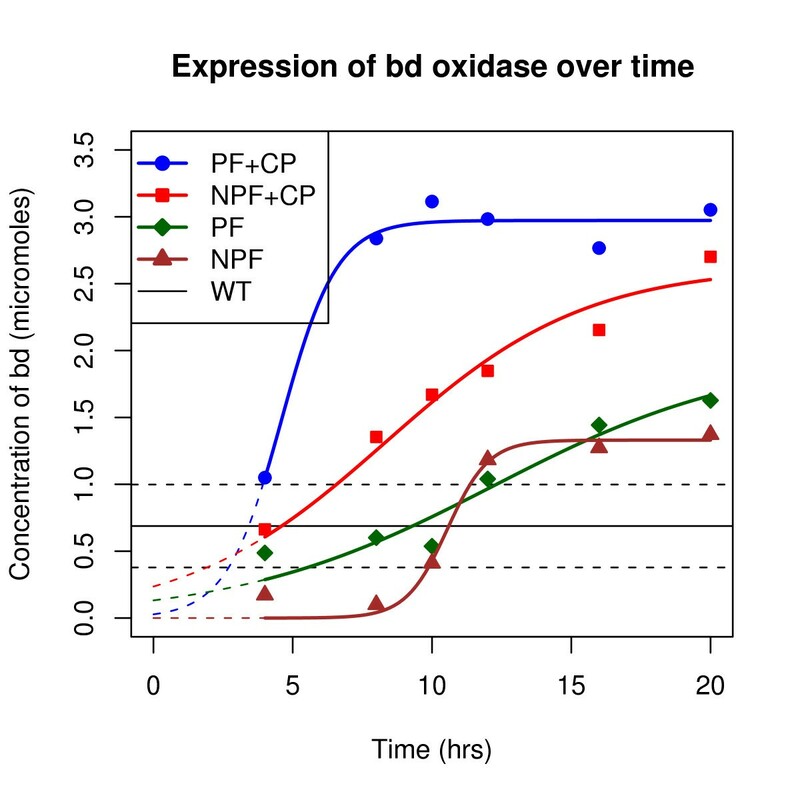 One of the significant outcomes of the positive feedback expression system is that the time required to reach steady state levels of bd oxidase membrane protein reduces from 20 h (in the no feedback control case) to about 8 h. There are, of course, several other factors that determine the precise numerical values of this performance gain, including promoter strength, plasmid copy number and the specific strain used. While these experiments do not have sufficient precision to quantify these performance gains, they do show that the positive feedback-based system accrues statistically significant gains. One of the goals of synthetic biology is to develop reusable gene regulatory systems. The positive feedback-based system we have developed is modular and can be readily extended as a building block in other protein expression systems. It can also be used to enhance existing protein expression systems, which use inducible promoters or exogenous polymerases such as T7 RNAP. It is therefore an attractive alternative to increase the yields of difficult-to-produce proteins such as membrane proteins. The authors would like to thank The University of Illinois for startup funds provided to KDB. The authors also acknowledge materials provided by Dr. Christopher V. Rao, Department of Chemical and Biomolecular Engineering at University of Illinois. KDB and RBG conceived the experiments. KB did the experiments and wrote the manuscript draft. GJN helped with plasmid construction and with manuscript revision. KY helped with the experimental protocols. KB and KDB analyzed the data. All authors read and approved the final manuscript.